HC Info is not accepting new consulting clients at this time but feel free to contact us–we might be able to recommend someone who’s good for what you need. Investigating Legionnaires disease. We will help you get the situation under control and then recommend a long-term strategy that is best for you. Solving Legionella problems in plumbing systems. We help you choose the best domestic (potable) water remediation strategy. We’ve done it for years, in hundreds of buildings, saving our clients hours and days, thousands of dollars, and perhaps a lot of embarrassment. No single remedial strategy is best for all systems because a number of factors must be considered. We do not sell chemicals or equipment so our recommendations are unbiased. Water management plans. Click here for more information. Litigation related to Legionnaires’ disease. Matt Freije has been retained as a Legionella expert by plaintiffs and defendants in more than 60 cases since 1999, with deposition and trial testimony. Click here to see our qualifications. 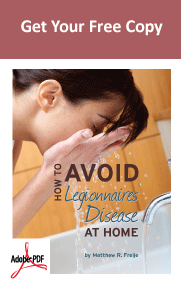 When you sign up for your FREE subscription to Legionella e-News, you get last month’s issue AND the free PDF “How to Avoid Legionnaires’ Disease at Home.” PLUS, you stay informed about outbreaks, guidelines and standards, new technologies, and upcoming events!